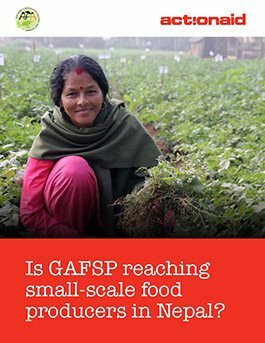 ActionAid and AFA (the Asian Farmers’ Association for Sustainable Rural Development) are both members of the GAFSP Steering Committee, representing Northern CSOs and Southern CSOs in Asia respectively. They commissioned a study to look at the successes and lessons learned from the AFSP implementation, with a focus on small-scale food producers; women producers; the engagement and participation of producer and civil society organizations; and climate resilience. Even though women’s empowerment and climate resilience are not explicit specific objectives of the AFSP, ActionAid and AFA consider that such goals are key to any successful attempt at enhancing food security and poverty alleviation in the long term.